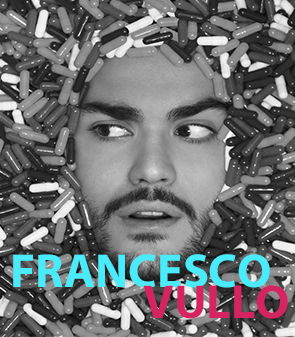 Francesco Vullo was born in 1994 in Palermo, Sicily. Since he was a child he has always been interested in drawing and creative activities. After high school, he attended European Institute of Design (IED) in Milan, where he graduated in illustration and animation in July 2016. His work is strongly influenced by events and contemporary culture and he gives many ironic and critic messages to society. All works reveal an irreverent vision of the world and society. In his creations we can find remakes of famous paintings, surreal combinations between objects of common use, illustrations that reveal the dark side of social networks. Most of his works have been published on several blogs and online magazines proving a great success in the network. In December 2015 he collaborated with the australian record company ETCETC for the realisation of artworks for the album Vacation of the artist Paces. In 2016 participated to the Tribeca Film Festival in New York with a work realized for the premiere of the movie “The bomb” by Smriti Keshari & Eric Schlosser. Parallel to his artistic research he found an art blog on instagram called: The Pink Lemonade. Actually counts almost 500k followers worldwide. From January 2017 to April 2017 his work has been featured on several online magazines as The Creators Project, NSS Mag, Konbini, Buzzworthy, The Post Internazionale, Yorokobu and YAHOO! Italy. In February 2017 his work was published on printed London based magazine called “ITALIANS”. From February to May 2017 he worked in Los Angeles as personal assistant in a art studio. In June 2017 he worked with the Spanish brand “Etnia Barcelona”. In the same period he did the cover of the new single by italian Dj and producer Max Brigante. In October he collaborated with the iconic brand Levi’s for the 50th Trucket Jacket anniversary.